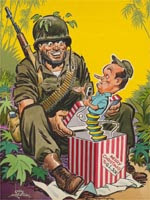 Hope's variety shows for the troops included comedy monologs, specialty acts, celebrity appearances, dancers, singers, and skits. His mildly irreverent humor, teamed with his variety troupe's beautiful women, provided a welcome respite for the U.S. forces, a reminder, in Hope's words, "of what they were fighting for." Library of Congress site on Bob Hope.